Another wonderful object from Angelica. This felt like a good day to blog it as the weather has turned cold today, I had to scrape ice off the car window this morning. 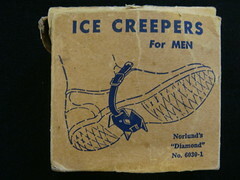 I like how simple these are, but do wonder how effective they would be..if it snows I will test them out..
"DIAMOND ICE CREEPERS" do an efficient job of protecting you from slips and falls on icy streets and steps. 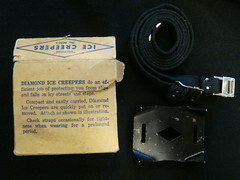 Compact and easily carried, Diamond Ice Creepers and quickly put on or removed. Attach as shown in illustration. Check straps occasionally for tightness when wearing for a prolonged period."